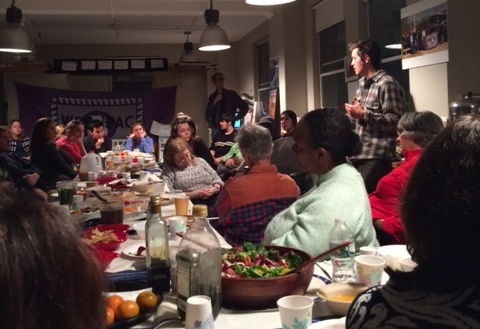 A big thank you to all who attended our community harvest dinner on Monday. By all accounts, it was a memorable evening as we transition now to the holiday season. A special thank you to Professor Tracy Basile at Pace University who brought Micmac elder Evan Pritchard with her as well as the students in her Food Revolution class. We all appreciated Doug’s presentation that expressed a spiritual dimension to our life and work and relationship with the life around us, the plants and the food we eat. We announced that the next WESPAC Food Justice Planning Committee meeting will take place on Thursday, December 17th, at 7pm in the WESPAC office. People may ask – what is food justice? One definition that we are comfortable with is: Food Justice means communities exercising their right to grow, sell, and eat healthy food. Healthy food is fresh, nutritious, affordable, culturally-appropriate, and grown locally with care for the well-being of the land, workers, and animals. Our collective food justice work can lead to a strong local food system, self-reliant communities, and a healthy environment.